Well, the 2015 running of CQWW CW is history. It seems almost anticlimactic to report RBN statistics, particularly since this year the system appears to have performed without a hitch for the entire 48 hours. 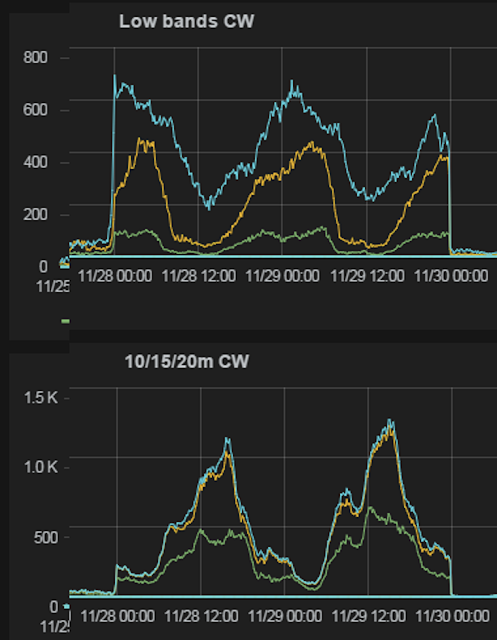 However ... the RBN forwarded over 7 million spots in the 48 hours of the contest, for an average of over 40.7 spots per second, and there are some lessons to be learned, for contestants and RBN node-ops alike. First, here are some graphs that dramatically illustrate how these spots were distributed among bands. The blue lines are 40 and 20, while the green lines are 160 and 10. The next question everyone asks is, "How many busted spots were there?" Mark, N2QT has done an analysis using CT1BOH's skimmerquality criteria as embodied in ARcluster V6, which shows an overall error rate of around 2.1 percent. Frankly, that's not as good as we had hoped, but I'll explore the reasons and possible solutions in another post. Bob, N6TV has also done his usual meticulous compilation of spot statistics, which you'll find below. It would great if you had a KML or map view of all the spotter stations, especially by band. Another request that is likely more difficult is that it would be helpful to have the SNR reports from RBN stations adjusted by their mean SNR to other stations since I assume not all RBN stations have equivalent receiving antennas. There are some stations that report me consistently 15dB over others. A combination of these two features would allow for better real-time analysis of antenna performance / patterns rather than simply knowing if you're making it to a region. You offer a great service and I'm a contributor.